Single channel with dual programmable solid state outputs. Printed circuit board (pcb) mounted. The DEFLECTOMETER display helps optimize the proper sensitivity setting to detect all vehicles including motorcycles. NO MORE GUESS WORK WHEN SETTING SENSITIVITY OR FREQUENCY! The front panel 7-segment LED DEFLECTOMETERTM provides visual feedback and assistance for setting the correct sensitivity, reading the frequency of the loop, reporting Loop Faults, and indicating Delay & Extension Timing functions. With a typical size vehicle over the roadway loop, the DEFLECTOMETERTM functions as a Sensitivity Meter. The optimum sensitivity setting should provide a reading of 5 . You can adjust the DEFLECTOMETERTM reading by using the front panel UP or DOWN sensitivity buttons. Automatic quantitative feedback of the loop system operation ensures that the detector is set to the most optimum sensitivity level to detect ALL vehicles, including motorcycles and high-bed vehicles. Following power-up or reset, the DEFLECTOMETERTM will indicate a 2 or 3 digit number (quickly flashes) that indicates the loop frequency of the loop & loop network. Keeping your loops separated by at least 5 KHz avoids crosstalk problems and future service calls. 10 levels of sensitivity (0 to 9) can be easily set using the UP or DOWN push buttons. 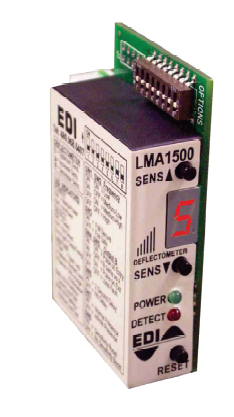 The Loop Fault Monitor continually checks the integrity of the loops and will report and store 3 types of loop faults; Open Loops, Shorted Loops, and 25% sudden changes in inductance. The Loop Fault Memory uses internal Non-Volatile memory to store and display the current and previous loop faults utilizing the front panel Loop Fault LED and DEFLECTOMETERTM. A power loss or reset will not delete this memory. A MUST FOR TROUBLESHOOTING! The detector will not drop a Call state if power is lost for a minimum of 4 seconds or less. A 2-second CALL delay time can be provided via the program DIP switch.
? Automatic Tuning - Lightning & Surge Protection - Four (4) Frequency Levels - Compatible with ALL radio controls & remote openers - Sensitivity Boost - Fail Safe and Fail Secure Configurations - Separate Color-Coded LED indicators - Wide Loop Inductance Range: 20 to 2500 micro Henries.